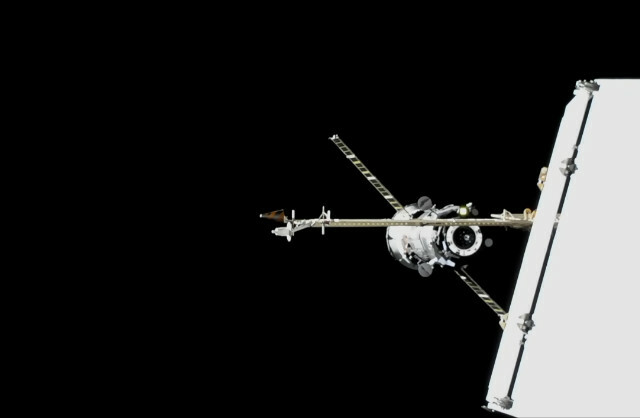 The Progress MS-10 cargo spacecraft regularly docked with the International Space Station’s Russian Zvezda module using the automatic system that allows Russian spacecraft a direct berthing. During the week the crew will proceed with the opening of the hatch and the procedures to make the Progress MS-10 an appendix of the Station. At that point, they can begin the unloading operations but in a few hours the American Cygnus cargo spacecraft is arriving and on the Station there are only 3 crew members so priorities will likely be established following the crew’s tasks. The crew situation is a key factor in the Progress MS-10 mission after the failure of the launch of two new members on October 11, 2018. At this moment on the International Space Station there’s less need for supplies and various tasks were postponed but for the Russian space agency Roscosmos it was crucial to show again the Soyuz rocket’s reliability. The arguments around human errors in various failed launches of Russian rockets in recent years continues to be a source of embarrassment for Roscosmos. On October 11, the emergency system worked well and the two astronauts were able to make an emergency landing and be back to Earth safe and sound, but now there’s a problem with the rotation of the International Space Station crew. The success of the Progress MS-10 mission with a launch on a Soyuz FG rocket, the same version used for manned launches, should convince Roscosmos to approve the sending of new crew members on December 3, 2018. The mission of the Progress MS-10 spacecraft is substantially accomplished. In fact it can’t return to Earth so it will be filled with hardware failed or otherwise become unusable and assorted junk and will disintegrate returning into the Earth’s atmosphere. This mission epilogue will probably take place in March 2019 but the exact date depends on various factors.